But just for the moment, it's all rather quiet. 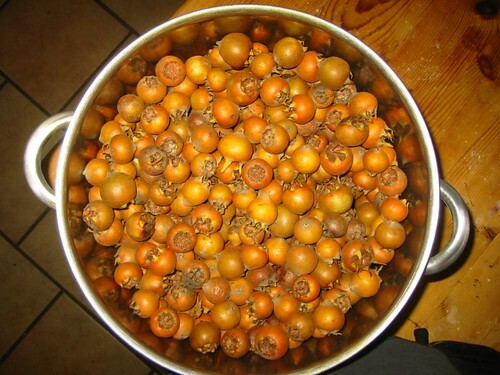 I made jelly with the wild medlars - don't they look tiny. They have a nice flavour and gave a good set. An excellent addition to anyone's forest gardening project. The harvest from the cultivated version "Nottingham" is over 10 kgs this year. I have given a few away and the rest are now resting until they are bletted but I think I'll need some new recipes to cope with this. Does anyone have any favourite treatments? I'm thinking chutneys and pickles or wine - we already make plenty of sweets. The fruit from the tree was covered in 7-spot ladybirds looking for a warm dry place to see out the winter. Luckily it's still relatively mild so I have ejected them and hope they can find a more appropriate place to snuggle into. 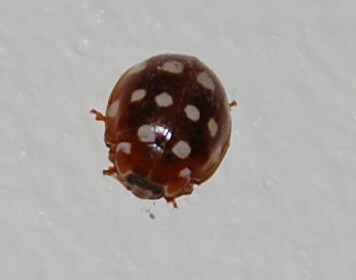 We found this tiny ladybird on the wall on the stairs, proving that wildlife will find a way. Not absolutely sure of ID on this, we think it might be a variation of Harlequin ladybird but would like to be proved wrong. Leave a comment if you know. And we're also wedding planning. 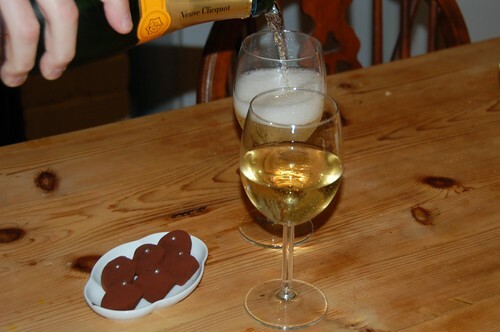 The bubbly and truffles were to celebrate choosing the engagement ring. It's really rather lovely but won't be ready until just before Christmas so no pictures until then. It's a cream-spot ladybird, not a harlequin. How interesting. Actually, I haven't seen any harlequin ladybirds at all this year, I suspect that the two cold winters have killed off most of them. Thanks for that Z, confirms what the other half researched for me last night. I hope the little chap/ess survives. We have had harlequins in Milton Keynes but not being here in the summer I'm not sure what went on last season.